Due to enrolment numbers St Mary’s School has split classes, thus it is important that parents understand how the classes are split. When changes are necessary the classes are divided by the Principal, following extensive discussion with the class teacher, in order to establish balanced classes with respect of the needs of the children. All the current education research shows that children work most effectively in small groups, therefore, the effect of splitting grades is minimal. It is worth noting that in a ‘straight’ grade the individual ability variation can exceed two years above or below that grade level. The Kindergarten class ceiling will be held at between 9-15 students per year depending on numbers in other junior primary grades. 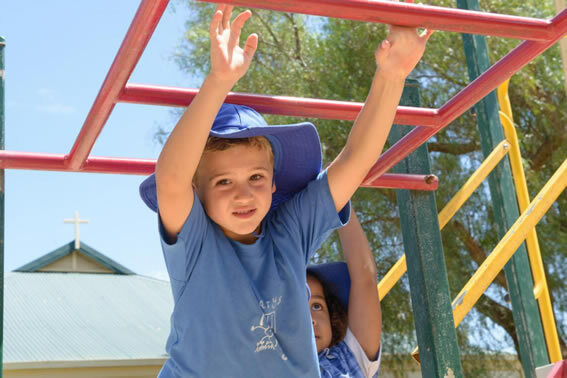 Kindergarten is the first year of our school and as such, your child, once enrolled at St Mary’s School will be able to complete his/her primary education within our school. The school recognises the importance of you, the parents, as the prime educators of your child and the need to effectively involve you in the school’s programme. We respect the right of all our parents to discuss their child’s progress with their teacher. Teachers do appreciate an appointment being made in order to make best use of the meeting time with you. Normally these times are after school. The Principal and teaching staff are responsible for the daily operation of the school and for establishing and implementing the educational policies of St Mary’s School. Specific problems relating to individual children’s learning difficulties should be addressed to the teacher concerned or the Principal through an appointment. Open Classrooms as advertised throughout the term, usually three per term. End of Term Two and Four, Reports for Kindy to Year Six. End of Term Two, compulsory Parent/Teacher Interviews for Kindy to Year Six. End of Term Four, requested Parent/Teacher Interviews for Kindy to Year Six. Teacher supervision will begin at 8.30am and conclude at 3.30pm. Children should not be on the school premises outside these hours without the approval of the Principal. Whenever a student is absent, a written explanation from a parent must be presented to the child’s teacher on the day of return to school. You are required by the Education Act of WA to inform the class teacher in writing of reasons for your child’s absence the first day the child returns to school. because she had a sore throat. Thank you. A child will be permitted to leave the school during school hours only when a parent makes a written request or calls personally for the child. Any child leaving the school during school hours must be collected from the classroom by an adult (a parent/guardian or their appointed representative) as they will not be permitted to wait on the roadside. You are requested to notify the school as soon as it is known that a child’s absence is likely to exceed one week. A long term planned absence (eg. holiday) should be referred to the Principal and class teacher at the earliest possible opportunity. All students are to have an art shirt to protect their uniform during art classes or the child will not be allowed to participate in the lesson. Bicycles are not to be ridden in the school grounds. They must be wheeled to the racks provided. Parents are asked to advise their children to walk bicycles over the crosswalk on the main highway. Camps provide unique and valuable educational opportunities for the children. It is traditional for Year 5/6 students of St Mary’s School to attend a biannual extended camp as a climax to their primary school social education. Parents are advised that this camp is heavily subsidised through their support of fundraising activities organised by the P&F and that their support is vital for keeping costs to families to a minimum. Parents are advised that up to four cultural events/visits are organised each year. Excursions off campus are organised as part of the educational experiences planned for your children and related costs are included in the school fees. You will be notified of these events in the newsletter or a note. If you do not wish your child to attend these events you will need to contact the Office. The form signifies your approval and permission for your child/children to attend the functions appropriate to your child/children’s education as determined by the school. If this note is not returned, your child will not be able to attend the excursion. Children will be set homework four nights per week to encourage the development of good study habits. Children are also encouraged to be responsible for completing homework themselves, and having their diary signed by a parent at least once per week. Parents should sight the homework to ensure it has been completed prior to signing the diary. Contact should be made with the class teacher if any inconsistency is noticed in this area. Lunches may be ordered daily from the BP service station by placing an order (on an envelope, money inside) at school. Price list is available from the office or from our website. A school fridge is available for student lunches and drinks. Please label lunch boxes and drink containers. A small percentage of sales is returned to the school in the form of book purchases which enlarges our library collection. Children are encouraged to borrow books on a regular basis, and parental assistance is requested to ensure that returns are made in good condition. All children are to have a library bag (available from the school office) at the beginning of the school year.